“Off” position (knob all the way in) cuts off all lights controlled by the switch. “Parking” position (knob pulled out to first notch) turns on the parking lights, tail lights, and license light. The map and instrument panel lights also will be turned on if the rheostat is set for these 1951 Buick lights. “Driving” position (knob pulled out to last notch) turns parking lights off and turns headlights on, while the other lights remain as in the “Parking” position. The headlights will be on the “upper” or “lower” beams depending on the position of the separate dimmer switch. In the “Parking” and “Driving” positions the 1951 Buick lighting switch knob must be rotated to control the map and instrument panel lights. With knob turned all the way counterclockwise these lights are off. Turning the knob clockwise the first step turns on the map lights only, the second step turns on the instrument lights and leaves map lights on, the third step turns map lights off and leaves the instrument lights on; further turning of knob clockwise reduces the brilliance of instrument panel lights. A thermo circuit breaker is incorporated in the lighting switch assembly, to protect wiring from damage due to short circuits in any lighting circuit controlled by the switch. The thermo circuit breaker consists of a bimetal blade and set of contact points connected in series with the lighting circuits. An abnormal flow of current through the circuit breaker, such as would be caused by a short circuit in a lighting circuit, heats the bi-metal blade sufficiently to separate the points and cause them to vibrate. The vibrating blade alternately opens and closes the circuit, thus reducing the flow of current and protecting the wiring against overheating and burning. The flickering light produced by the vibrating circuit breaker serves as a warning to the operator of vehicle that a short circuit exists. 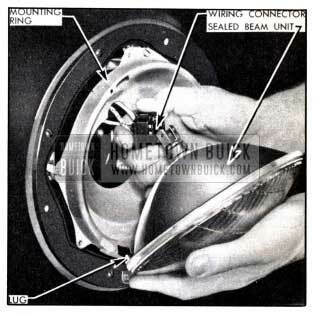 If the 1951 Buick lighting switch is suspected of being faulty, the contacts can be tested by connecting a short jumper wire between No. 1 terminal and the other terminals while observing any change in the brilliance of lights affected. With switch in “Parking” position (first notch out) connect jumper wire between No. 1 and No. 2 terminals and note change in parking lights. Bridge between No. 1 and No. 3 terminals and note change in tail lights. With switch in “Driving” position (last notch out) bridge between No. 1 and No. 4 terminals and note change in headlights. If no change in brilliance of lights is noted the switch contacts are satisfactory and the cause is in the wiring circuit connections or lamp bulb. If switch is faulty it must be replaced since internal repairs cannot be made. Disconnect ground cable from battery and disconnect wires from 1951 Buick lighting switch. Loosen knob retaining set screw with a 3/32″ Allen wrench and remove knob from rod. Remove switch mounting nut with Wrench J 1589 and remove switch from panel. See figure 10-81. Pull control rod out as far as possible, insert stiff wire into small hole in switch case to depress the catch and pull rod out. NOTE: Knob and rod may be removed as a unit in this manner before removal of switch. When installing lighting switch, connect wires according to color codes as shown on chassis wiring circuit diagrams in Section 10-J. When connecting battery ground cable use care to properly wind the clock (par. 10-21, e). To test the thermo circuit breaker, remove lighting switch from instrument panel to avoid possible damage to adjacent instruments. Since the current required to open the circuit breaker contacts depends somewhat on outside temperature, the circuit breaker should be tested at normal temperature (70° to 80°F.). Connect an ammeter and a carbon-pile rheostat in series with the No. 1 terminal of lighting switch and positive terminal of a 6- volt battery, and set rheostat to provide maximum resistance. Rheostat must have capacity for 42 amperes and be adjustable down to .14 ohms. Connect the protected (not numbered) terminal of lighting switch to negative post of battery. Adjust rheostat to give 42 amperes. The circuit breaker should start vibrating in three minutes or less. Adjust rheostat to give 30 amperes on ammeter. The circuit breaker should remain closed indefinitely at 30 amperes. If circuit breaker does not operate as specified the lighting switch assembly should be replaced. The circuit breaker is not adjustable and no attempt should be made to alter the calibration by bending the bi-metal blade. The contact points must not be filed or sanded. 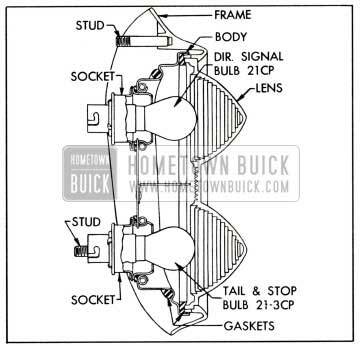 The 1951 Buick headlamp assembly on each front fender consists of a body, wiring, connector, mounting ring, sealed beam unit, retainer ring, door and gasket. See figure 10-82. The 1951 Buick headlamp body is attached to the fender with a gasket between body and fender to provide a water-tight seal. The wiring to which the connector is attached extends through rear of lamp body and connects to a terminal block on the radiator baffle. The mounting ring, which supports the sealed beam unit, forms a ball and socket joint with the body, to which it is attached by one coil spring and two beam adjusting screws. The sealed beam unit is attached to the wiring connector and is held in the mounting ring by the retaining ring which is attached to mounting ring by three screws. The headlamp door surrounds the retaining ring and is attached to the body by a lug at the top and one screw at bottom of door. A rubber gasket, held in the door by W-shaped retaining springs, form a seal between door and retainer ring. See figure 10-82. 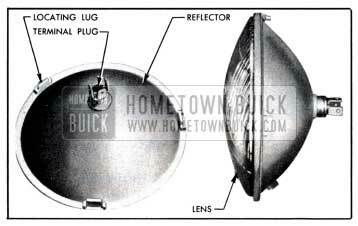 The 1951 Buick sealed beam unit consists of a lens, reflector, terminal plug, and two lamp filaments assembled into one securely sealed unit. See figure 10-83. 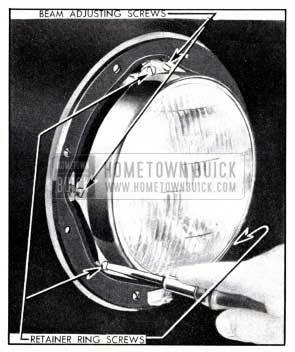 The 1951 Buick lamp filaments are located with respect to the reflector so that two separate and distinct headlight beams may be obtained, depending upon which filament is burning. When the lower lamp filament is burning, an upper or straight forward light beam is obtained. The upper beam is designed to illuminate the road evenly, and is for use on the highway when no other vehicles are approaching. See figure 10-84. When the upper lamp filament is burning, a lower or depressed light beam is obtained. The lower beam is designed so that it does not throw a dazzling light into the eyes of an approaching driver. At the same time, the distribution of light is such that the right side of road is illuminated as far ahead as is practicable without causing glare on curves. See figure 10-85. The lower beam is intended for use in traffic and on the highway when meeting other vehicles. The driver may select the upper or lower headlight beam as traffic and road conditions demand by operating the dimmer switch mounted on the toe panel in a convenient position for the left foot. 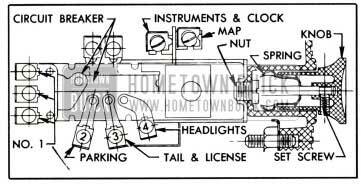 The 1951 Buick dimmer switch opens and closes the circuits to the upper and lower lamp filaments in both sealed beam units, thereby alternately raising and lowering the headlight beams with each successive operation of the switch. Depression of switch button turns the rotary contacts one position within the switch. The spring-loaded button automatically returns to the reset position when released. The switch contacts overlap so that the new circuit is closed before the previous one is opened, in order to prevent both beams being off at the same time during operation of the switch. Whenever the upper headlight beams are lighted, a beam indicator bulb on the instrument panel also lights, producing a small spot of red light above the steering column on Series 40, or in top of speedometer in Series 50-70. This indicator warns the driver that the upper beams are lighted. For safety reasons, he should never pass an approaching car with the beam indicator showing red. When a 1951 Buick sealed beam unit is burned out or broken it must be replaced as a unit assembly. Two types of sealed beam units are available. In one type, the glass lens and a glass reflector are fused together. In the other type, the glass lens and a metal reflector are assembled together with a gasket to provide a tight seal. Both types are interchangeable. See figure 10-83. 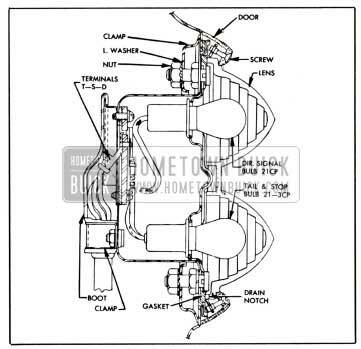 Remove screw at bottom of headlamp door, swing door outward at bottom and lift up to remove. Remove the three retainer ring screws but do not disturb the two beam adjusting screws, then remove retainer ring. See figure 10-86. Remove sealed beam unit from mounting ring and separate it from the wiring connector. Install new sealed beam unit by reversing removal procedure. The lens is marked “TOP” and the reflector has three lugs which fit into notches in the headlamp mounting ring. See figure 10-87. Before installation of headlamp door, adjust headlamp for proper aim as described below. 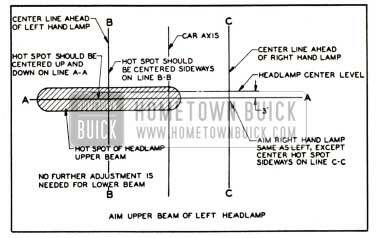 The 1951 Buick head lamps must be properly aimed in order to obtain the maximum road illumination and safety that has been built into the head lighting equipment. The headlamps must be checked for proper aim whenever a sealed beam unit is replaced and after any adjustment or repairs of the front end sheet metal assembly. Head lamp aiming machines are in general use. When using one of these machines make certain that it is in proper condition, and carefully follow the instructions of the manufacturer. Headlamp aiming charts are also available and will give good results if used properly; see subparagraph c below. Regardless of method used for checking headlamp aim, car must be at curb weight, that is, with gas, oil, water, and spare tire, but no passengers. Tires must be uniformly inflated to specified pressure (par. 6-8). If car will regularly carry an unusual load in rear compartment, or a trailer, these loads should be on car when headlamps are checked. Some states have special requirements for headlamp aiming adjustment and these requirements should be known and observed. Adjust light beam up or down as required by turning the top beam adjusting screw. See figure 10-88. Adjust light beam to right or left as required by turning the side beam adjusting screw. Check final setting of headlamps after installing headlamp doors. If a headlamp aiming machine is not available a chart may be prepared as shown in figure 10-89. It is desirable to make the chart on a large panel of plywood or other suitable material, painted flat white, so that it can be shifted into proper alignment with car, as explained later. Note that the chart consists of two horizontal and three vertical lines. The upper horizontal line is located at the same distance from floor as the center of headlamps and the lower horizontal line (A-A) is 3″ below the headlamp center line. Where State laws require a loading allowance be governed by these requirements for the lower line. Vertical lines B-B and C-C are located at the center of head lamps and equally distant from the center vertical line which corresponds to axis of car. When using the headlamp aiming chart, place car on a level stretch with chart placed 25 feet ahead of both headlamp lenses, and parallel to them. Place a narrow piece of masking tape on the exact vertical centerline of the back window glass. Shift chart sideways as required to bring the center vertical line into exact alignment with the center of radiator ornament and center of the back window glass. Set lighting switch in “driving” position and operate dimmer switch to give upper beam. Cover right headlamp and note light pattern made on chart by the left headlamp. The center of zone of highest light intensity should fall on the intersection of horizontal line A-A and the vertical line B-B as shown in figure 10-89. Cover left headlamp and check right headlamp in the same manner. Each front parking and signal lamp contains one 21-3 CP lamp bulb which provides a 3 CP parking light and a separate 21 CP direction signal light. The pins on lamp bulb and slots in socket are offset to prevent improper installation of bulb in socket. The parking light is controlled by the lighting switch and the circuit is protected by the switch thermo circuit breaker. 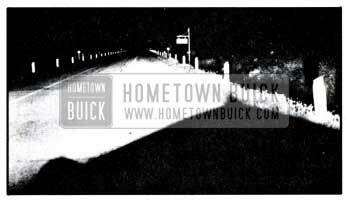 The 1951 Buick direction signal light is separately controlled by the signal switch and the circuit is protected by the “Direction Signal” fuse on the fuse block under the cowl. The combination tail, stop, and signal lamp on each rear fender contains one 21-3 lamp bulb which provides a 3 CP tail light and a separate 21 CP stop light. When car is equipped with direction signal lights the lamp also contains one, 21 CP signal lamp bulb. The 1951 Buick tail light is controlled by the lighting switch and the circuit is protected by the switch thermo circuit breaker. The stop light is separately controlled by the brake operated stop light switch and the direction signal light is separately controlled by the signal switch. The stop and direction signal light circuits are protected by the “Direction Signal” fuse on the fuse block under the cowl. On Series 40, a lamp bulb may be replaced by pulling the socket out of lamp, working inside the trunk compartment. See figure 10-90. On Series 50-70, a lamp bulb may be replaced by removing the lamp door on outside of fender. When installing lamp door be sure that gasket is properly positioned to seal door. See figure 10-91. Pins on the 21-3 CP bulb and slots in socket are offset to prevent improper installation of bulb in socket. On Series 40, the wires are attached directly to the sockets inside the trunk compartment. On Series 50-70 the wires are connected to three terminals (marked “T,” “S,” “D”) on lamp body inside the fender. These terminals are protected by a boot which snaps over a flange on lamp body and is further retained by a clamp. See figure 10-91. 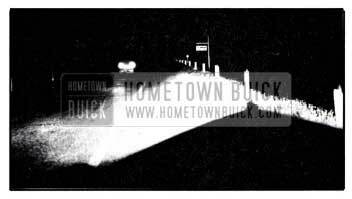 The 1951 Buick rear license lamp is mounted in a protected position in the rear bumper guard upper rail, above the license plate. It contains one 3 CP lamp bulb which operates in conjunction with the tail lights and the circuit is protected by the circuit breaker on lighting switch. To replace lamp bulb, remove two coin slotted sleeve nuts which attach the lamp socket and wire assembly. The 1951 Buick speedometer and gauges are illuminated by four 2 CP lamp bulbs, and the clock is illuminated by one 2 CP lamp bulb. These bulbs are mounted on forward side of instrument panel to provide indirect lighting. The instrument panel lights are controlled by the lighting switch as described in paragraph 10-53 and the circuits are protected by the switch thermo circuit breaker. Two map lights are located in the radio speaker grille adjacent to the ash trays. Each map light consists of a 2 CP lamp bulb mounted on forward side of the grille in position to project light downward through an opening in grille. Both lights are controlled by the lighting switch as described in paragraph 10-53. To replace the bulb in a map light remove the adjacent ash tray to obtain access to the bulb holder. Place a small screwdriver behind the tab of bulb holder and move holder toward center of ash tray opening until it snaps into the full “out” position. After replacing the bulb, slightly press in on bulb holder and push it back into position, then install ash tray. 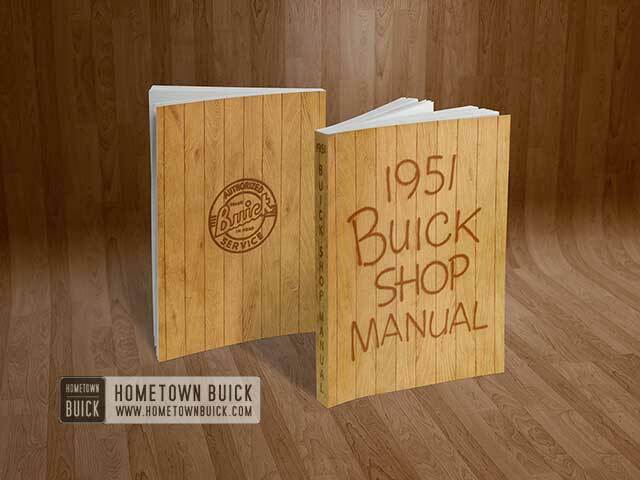 The 1951 Buick instrument panel compartment (glove box) is lighted by a 2 CP lamp bulb mounted in a light switch attached to top edge of the compartment. The spring-loaded switch makes contact when the compartment door is opened. As the door is closed it depresses the switch button to break contact and turn the light off. This circuit is protected by the 30 ampere “Dome” fuse on the fuse block under cowl. On Series 40 the dome lamp switch is incorporated in the lamp assembly. On Series 50-70, the dome lamp switch is separately mounted on left side of body. Door jamb switches also control the dome lamp so that the lamp lights when door is opened and is turned off when door is closed. The dome lamp wiring is protected by a 30 ampere fuse, marked “Dome,” on the fuse block under the cowl. Dome lamp wiring circuit diagrams are given in Section 10-J. 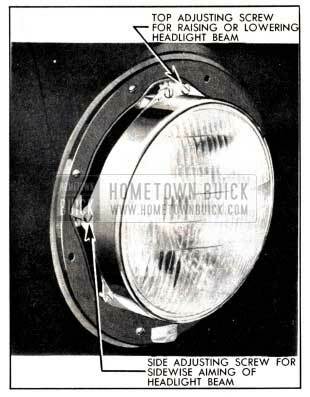 The 1951 Buick luggage compartment lamp is mounted on the rear compartment lid and contains a 2 CP lamp bulb. A switch built into the lamp assembly automatically turns the light on when rear compartment lid is raised, and turns light off when lid is lowered. The luggage compartment lamp is connected to the dome light circuit so that it is protected by the 30 ampere “Dome” fuse on the fuse block under cowl. Either a Casco or a Rochester Products cigar lighter may be used. These optional lighters differ in design so that parts are not interchangeable. See figure 10-92. 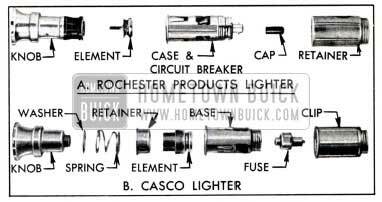 Either 1951 Buick lighter is heated by pressing the knob in until it latches; the knob will automatically unlatch and return to “off” position when heated to proper temperature. In the Casco lighter, a replaceable thermal fuse located in the lighter base protects the lighter element against overheating if knob is manually held in for too long a period. In the Rochester Products lighter, a circuit breaker located in the case provides protection against overload and overheating. See figure 10-92. The Rochester lighter circuit breaker can be easily reset after it has opened the circuit due to an overload. Disconnect the bayo11et type wire connector, remove insulating cap from end of circuit breaker and push the circuit breaker plunger in until it is engaged. Reinstall insulating cap firmly on lighter case and connect the wire.